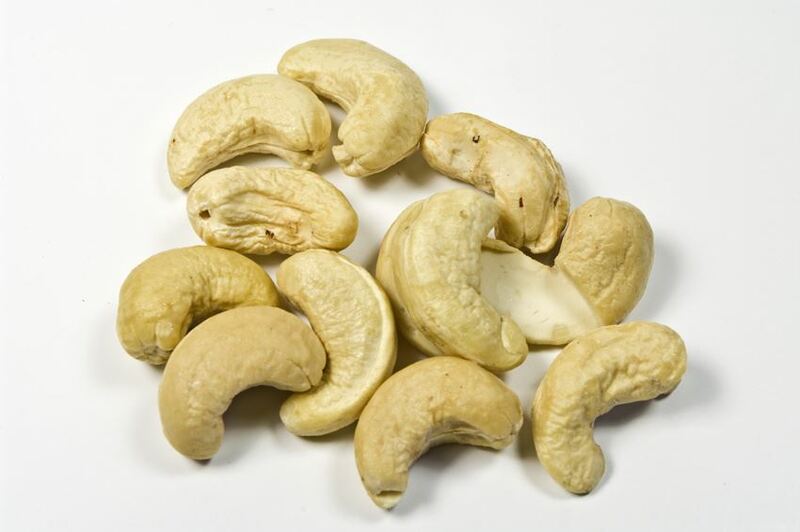 Cashew nuts are a popular snack because of they fine creamy mild taste. They can be used in many different ways, be it in muesli, salads, desserts, vegetable or meat dishes or in trail mix. Cashew nuts are the fruit of the cashew tree (Kaschu - Anacardium occidentale). Cashew trees belong to the Anacardiaceae (the sumac family). The trees can grow up to 12 m high. Originally they are at home in Brazil, today they are also grown in Africa, Asia, and South America. Cashew trees bear a fruit called cashew apple, a “pseudo fruit” shaped like a bear or pepper. The cashew nuts themselves are not inside the cashew apple but at its outer skin in fruit itself, much smaller and called “elephant louse”. The kidney shaped, 2-3 cm light cashew nuts contain many mineral nutrients such as calcium, magnesium, iron, phosphorus and copper. In addition, they are vitamin providers, containing mainly B1, B3, and B5, and a good source of energy because of their mineral nutrients. Finally they are especially rich in tryptophan, an essential amino acid. ZIELER & CO. offers cashew nuts both natural in different sizes and roasted and refined. The large, light, crisp nuts are from Vietnam or India. Our nuts from certified organic farming come from India or South America. The organic dried fruit and nuts are exclusively grown in certified companies. Permanent checks, e.g. Regarding pesticides, guarantee perfect goods.